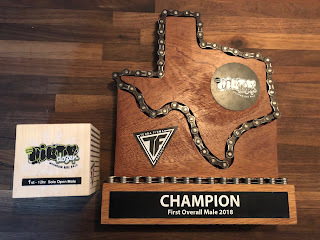 This race report was submitted by the 2018 Dirty Dozen’s overall winner, John Russell. Head on over to his race blog, Keep on Rolling to read about more of John’s incredible adventures. It was Halloween when I had enough. I looked in the mirror and said “It’s time to get yourself out of this rut you’ve been in, write down a race and commit to getting healthy.” I was scared to do that because it had been 5 years since I last raced. I was worried about how I would perform, but mostly worried I would not be able to stick to a plan and stop doing all the self-sabotaging things I’d been doing the last few years. I dusted off my bike, hooked it up to my trainer and started my journey to a healthier happier me. Here we go….. I LOVE the Dirty Dozen 12 hour mountain bike race. It’s at the perfect time of the year. When I was racing before, I always used it as my motivation to stay healthy through the holidays, and after the New Year it helped me stay focused on a goal. This race is held the first week of February and the venue is always Warda. Terra Firma Racing puts on incredible races. They are well-organized and run smoothly. The course is always well marked too. Once the race is over, they are prompt about getting to the awards and recognition. To me, Terra Firma races feel like a family affair. The people who participate in them are some of the best in cycling. 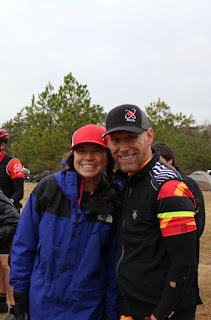 Every time I walk away from an endurance race, I also walk away with new friends. This year was to be no exception. I was able to really stick to my training during the months of November, December and January. This was not only my first race in 5 years but it was my first race since 2009 without a coach, so I took it seriously. I self-coached myself for this race using all the knowledge I gained from years of being coached by one of the best in the industry. I knew where I was fitness wise and on Feb 3rd I lined up with approximately 200 other crazy folks to race the Dirty Dozen! After the le mans run I jumped on my bike and started smiling. The first lap was a pretty hot pace and it had been raining. The roots were slick and a bit dangerous, but I was having a blast! I normally get nervous and worry about where I am in the race vs. my competitors, but that did not happen this year. I had a few goals for the race. Number 1 goal was to have fun. I also had a goal of making this race about me and vs. the distance rather than me vs. someone else. Riding your bike as fast as you can for 12 hours is super hard. I think when you start making it out as a race with you vs. someone, it gets even harder. I set out to ride my race and give my best effort for the daunting time of 12 hours. I had a few goals for the race. Number 1 goal was to have fun. I started ticking off laps at a pretty quick pace. On hour 3 I was feeling pretty worn out. I remember thinking man… I have 9 hours to go and I am already hurting. But I have done this enough to know you have tough times, then happy times and these “up and down” feelings can occur many times during 12 hours. So, I just relaxed and started leaning on the folks around me to take my mind off what I was feeling. I continued smiling to make myself feel better. I started talking to all the racers on the course I was riding with. That was a ton of fun for me! Once I did that, it relaxed me and I was actually able to ride faster with what felt like less effort. The most fun I had during the race was coming through the barn and seeing my pit crew. Before getting there though, I would see my Bicycle Sport Shop Teammates. Each time I passed, they gave me support with cheers! They were all doing this on a team and it was awe-inspiring to be out there with them sharing the day. I am new to the Bicycle Sport Shop Team and I am very proud to represent such an amazing bike shop with supportive, fun teammates! Bicycle Sport Shop even had neutral support there helping anyone that needed it during the race. Once I got to my pit I was greeted by my sweet lady, Laura Neighbors. She was simply the best, but anyone that knows her already knows that. She would stand there smiling giving me encouragement. Laura was in the pit with my buddy Shawn Hutcherson. He was amazing also, staying the entire race helping Laura support me. I had two caring people in my corner and a new team to race for. I felt blessed. I really enjoy the feeling you get when riding in the woods. It’s truly one of the only times in my life I am 100% in the moment. I am not thinking of anything other than what I am doing at that very second, and boy is that nice. About 6 hours in I started seeing the racers that were competing in the 6-hour portion of the race finish. I was smelling food and beer every time I came through the pit area. I was jealous they were able to enjoy that, but I knew riding another 6 hours would make the food and beer taste even sweeter. It was then I decided to not slow down and stay strong and steady for the next 6 hours. 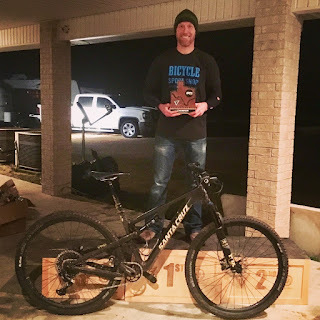 For this race I mentioned I had a new team, but I also had a new bike – a Santa Cruz Tallboy! Man, I am in love with that thing! It’s one of those bikes you just feel like you’ve had forever. It fits perfect. I can honestly say I have never been so comfortable in a race before. Going into the race, I had a few nagging injuries I was concerned about. However, I never experienced any hand pain, knee pain or pain anywhere! This bike also has a dropper post. There is nothing technical at Warda to need this, but over the course of 12 hours it was really nice to hit the button and micro lower my saddle here and there to change things up a bit. I feel like it really helped keep my legs fresh and I was happy to have it. My favorite part of the race is when it gets dark. I love riding in the woods at night. I like the tunnel vision the light creates and the way my peripheral vision is blacked out. I focus only on what is directly in front of me. It’s kind of relaxing. Once it was fully dark I kept seeing something out of the corner of my eye in the same spot every lap. It was cracking me up, but what I thought I kept seeing was a 30-foot tall nutcracker figure…. You know the kind that the mouth opens up and you crack nuts with? I usually only see them around Christmas time. When I started seeing this every lap I knew I might be getting tired but I was having fun. I still don’t know what I was seeing to make me think it was a giant nutcracker. I kept seeing something out of the corner of my eye in the same spot every lap. It was cracking me up, but what I thought I kept seeing was a 30-foot tall nutcracker figure…..
Another thing I enjoy are the shorter laps at this race. Each time I came into the pits it would regenerate energy and keep me motivated. With Laura and Shawn being there, folks were coming by to visit them and I could talk to them when I came through too. My fellow teammate Antonio Garza (who got second place in Solo Sport Male) was pitting with me. I would see him from time to time along with his family. It was a really great experience. It felt like a big family gathering out there, I loved it. The last few laps were fun and when the clock struck 8.30 PM. I had just completed my 17th lap. I had been riding for 11 hours and 30 minutes. I thought I was going to do another one but I could not finish in time so that was the end of my race. It was such a great time doing this. My final tally was 17 laps, 120+ miles of dirt and lucky for me a 1st place finish in the Solo Open Male category. I had so much happiness come over me when I realized how the race went and how much fun I had the entire time I was riding. It feels great when a plan comes together. All the training I did mentally and physically paid off and it was time for my first beer of 2018! I’ve raced the Dirty Dozen a number of times but this one was special for me. As I reflect back over the race, it feels like I have a weeks’ worth of memories all made in 1 day. Coming back after a five-year layoff was hard, but that time away made me realize how much I love this sport and the people that play in it. I came into this race excited and I left it with even more excitement. I had my lady in my corner for this one, some of the best friends a guy can have and support from the greatest bike shop in the country. What more could you ask for? I made a ton of new friends out there and hopefully I can keep this momentum up for the rest of the year. Till next time!!! Coming back after a five-year layoff was hard, but that time away made me realize how much I love this sport and the people that play in it.